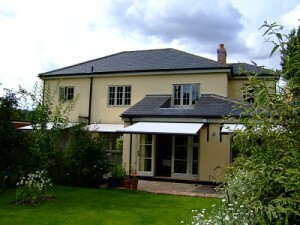 Our skilled team are on hand to diagnose and repair Weinor, Markilux and Thomas Sanderson awnings. In the event of breakdown simply get in touch and a member of the team will visit at a time of your convenience to assess your repair needs. Types of awning repaired: include patio awnings, balcony awnings, pergola awnings and conservatory awnings. There are many problems that can affect awnings most of which are brought on gradually by fair wear and tear this is due to the numerous components of an awning that can be prone to breakdown. Fabric repairs: Due to the UK climate one of the most common problems that occur in awnings over time is the perishing of fabrics and stitching, the suns rays can perish and crack awning fabrics also rain and moisture can have a devastating effect on the stitching.Sustained exposure to wind can stretch the fabric. Awnings that have been left out in the sun or have spent the majority of their time rolled up often suffer with the above problems. Awning arms: The awnings retractable arms are again another area that is over the years put under a significant amount of strain sometimes awning arms snap due to the tension they are under when extending and retracting the awning often causing the arm to snap, and sometimes rip the awning fabric itself. Motors: Any moving part can from time to time breakdown awning motors are another common repair for the team at Savills average motor life for most brands of awning in the uk ranges from anywhere between 5-7 years. Fabrics: Savills will recover your awning with market leading Weinor, polyester or acrylic Fabric this tough treated fabric will be functional for many years to come and is available in over 200 different colours. Arms; When repairing an awning arm it is recommend that both arms are replaced in tandem this is due to the fact that the new arm will be stronger than the old creating an imbalance which can ultimately lead to the older arm snapping. Motors; this repair is the most simple of the three common awning repairs, our team will simply order and replace the faulty motor. Warranty; All of the awing repairs in Kent mentioned above will include a 3 year warranty when carried out on a domestic awning and a 1 year warranty when applied in a commercial situation. For Awning repairs Kent contact Savills the Awning Company ltd. Repairs can be carried out in Ashford, Canterbury Whitstable, Maidstone, Tunbridge wells, Bromley and any other town or village in the Kent area. Please not we only repair the following awnings: Weinor, Markilux and Thomas Sanderson.